Pro Bike Rider, Rally Car Driver, now add tattooer to the list. We traded tattoos... Mahalo for the quote. Shoots, big. There's always a reason for us to party and this Monday, November 23rd, is no exception. Our man Cuyler is gonna take an extended vacation and hang out with Logan in Austin. He had such a great time when he was there last . . . he just had to get back. Plus, he gets to roll with the Log Dog! Anyways, we're gonna throw him a little party and show some love just so he remembers where home is. We'll have a grill up and running, so bring a dish with enough to share. The coolers are already there and will be stocked with ice so you can bring beverages. If you're of age, BYOB. Again, if time permits we'll bring out the bunny-hop poles and the Grind box so don't forget your bikes. The BBQ will be going so bring some food as well. If you have any questions please let me know. You can go ahead and comment over here so people will know what you're bringing. Cuyler's on a plane this Thursday so make sure you come down on Monday at 8:00pm and give him a little kiss . . . or a big one. We might even have some special guests. Where Da Wild Tings Stay! 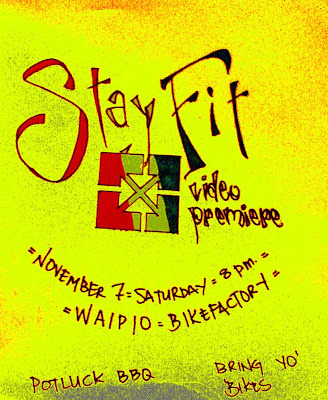 We are premiering the hot new DVD from Fit Bike Co., "Stay Fit" this Saturday night at BIKEFACTORY Waipio. As you all know, a lot of the Fit team has left since the completion of this flic so this will be the last DVD from them including Chase Hawk, Dakota Roche, Chase Dehart, Russ Barone, Trey Jones and Rob-O Morales. I'm not sure if I'll have DVD's available for sale but we will be taking preorders. This will be an evening of wine, women and song . 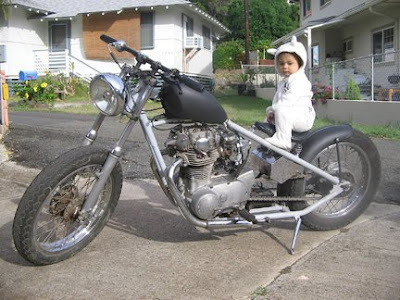 . . or at least beer, BBQ and bikes. Same basic game as last time . . . be here about 7:30pm and I'll start the flic at 8:30. We'll have a grill up and running, so bring a dish with enough to share. The coolers are already here and will be stocked with ice so you can bring beverages. If you're of age, BYOB. We'll also try to have some folding chairs on hand so there's somewhere to sit if you don't bring your own. Again, if time permits we'll bring out the bunny-hop poles and the Grind box so don't forget your bikes. The BBQ will be going so bring some food as well. If you have any questions please let me know.